When the CJI asked about the whereabouts of Justice Karnan, the advocate said he was ‘very much in Chennai’. Calcutta high court judge Justice C S Karnan on Thursday moved the Supreme Court seeking recall of an order holding him guilty of contempt of court and sentencing him to a six-month jail term. A petition on his behalf was mentioned before a five-judge bench headed by Chief Justice J S Khehar, which agreed to look into it. When the Chief Justice of India asked about the whereabouts of Justice Karnan, Advocate Mathews J Nedumpara, who mentioned the plea on behalf of Justice Karnan, said he is ‘very much in Chennai’. When the advocate was also asked to show papers that authorised him to represent the controversial judge, he showed the notorised papers of authorisation for filing the plea on behalf of the judge to the bench. Nedumpara also said that 12 advocates on record had refused to represent Justice Karnan. The plea on behalf of the judge was mentioned before the bench, which also comprised Justices Kurian Joseph, R F Nariman, U U Lalit and Abdul Nazeer, which had just concluded the day’s hearing on the issue of triple talaq. The seven-judge bench of apex court had on May 9 passed the order sentencing Karnan to jail by holding him guilty of contempt of court and sentencing him to six months imprisonment, a day after he defiantly ordered eight apex court judges to be put behind bars. It had also ordered the West Bengal police to take him into custody forthwith. However, before the pronouncement of the apex court order, Justice Karnan had left Kolkata and was reported to be staying in Chennai. The West Bengal police is yet to arrest the judge. Justice Karnan, who is on warpath with the Supreme Court for last several months, is the first sitting judge of a high court to be sentenced. He was due to retire next month. The bench, comprising senior-most judges, Justices Dipak Misra, J Chelameswar, Ranjan Gogoi, M B Lokur, P C Ghose and Kurian Joseph, had said it was satisfied that Justice Karnan be sentenced for six months in jail adding that the contempt power does not recognise who is what, whether he is a judge an individual or a private person. 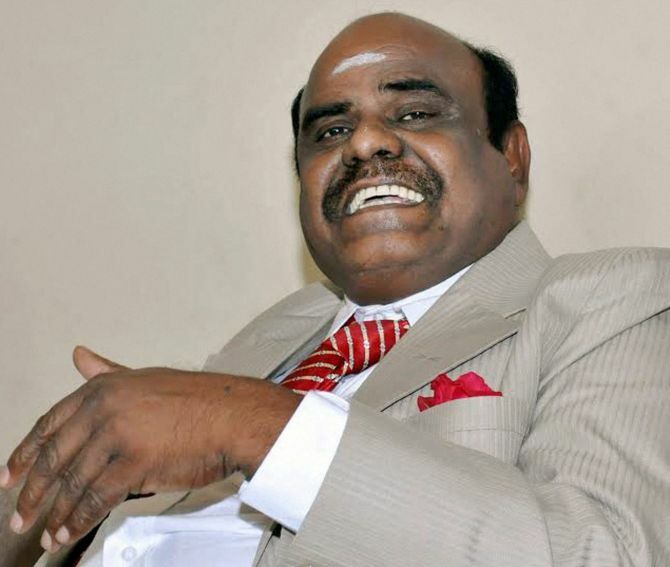 Justice Karnan, who was divested of his judicial and administrative powers following his tussle with the Supreme Court, had on May 8 "sentenced" CJI Khehar and seven other apex court judges to five years imprisonment after he ‘found them guilty’ under the Scheduled Caste & Scheduled Tribe (Prevention of Atrocities Act, 1989) and the amended 2015 Act. The seven-judge constitution bench had initiated contempt of court proceedings against Justice Karnan after he repeatedly levelled allegations of corruption against Madras High Court chief justice and other judges. While pronouncing him guilty of contempt and sentencing him, the court had cited Justice Karnan's claim made before a medical team, which was sent to examine his mental condition, that he was ‘absolutely normal’ and had a ‘stable mind’. The apex court had also banned the media, both print and electronic, from publishing the contents of further orders passed by Justice Karnan, as also the statements made by him. The apex court had on March 10 issued a bailable warrant against Justice Karnan to ensure his presence before it in the contempt case. 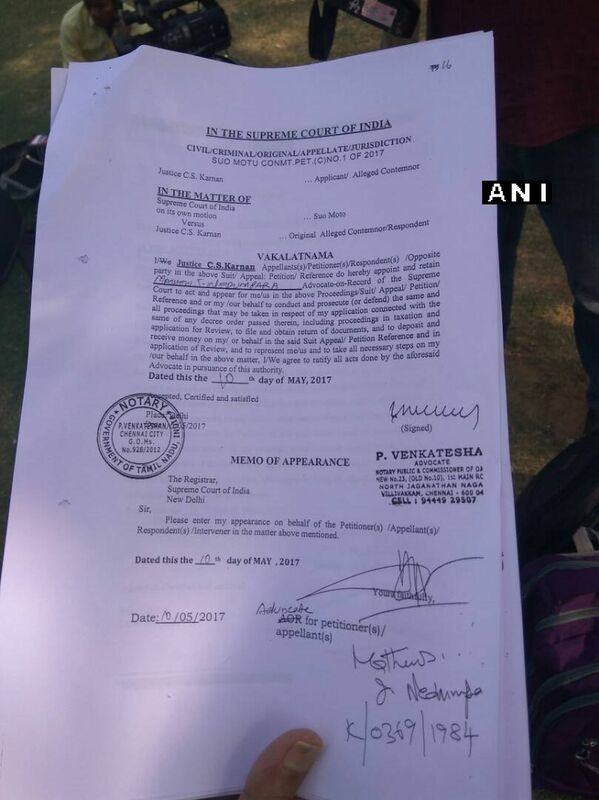 The warrant had come almost a month after the court had asked Justice Karnan to appear in person and explain why contempt proceedings not be initiated against him. On March 31, Justice Karnan had appeared in the Supreme Court in the contempt case, a first in Indian judicial history, and sought restoration of his powers as a precondition for his re-appearance, but the plea was rejected. However, a belligerent Justice Karnan had told the court he would not appear before it again even if he was arrested and put in jail. He was transferred from the Madras HC for his repeated allegations and run-ins with its chief justice and fellow judges. A recalcitrant Karnan had on February 15, 2016 stayed his transfer order, which was suspended by the Supreme Court. The apex court had earlier even asked the chief justice of the Madras high court not to assign him any judicial work.